Festool saw blades are engineered and designed for cutting efficiency, long-life, and superior cutting results. The carbide tipped Solid Surface/Laminate blade for the TS 55 Plunge Cut Saw is a long-lasting , high cut quality blade for laminate flooring and solid surface countertop material. 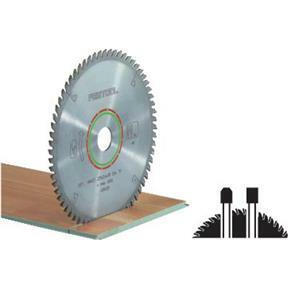 This blade incorporates a TC (Triple Chip), or trapezoidal flat tooth saw blade design, wherein the edges of alternating blade teeth are beveled on both sides. These beveled teeth alternate with the flat teeth when cutting into the material for smoother and more efficient cutting. This thin-kerfed blade design meets less resistance, for more efficient cutting, and produces less material waste. Laser cut expansion slots reduce vibration for faster, quieter cutting. An oversized 20mm arbor enables more secure fastening of the blade to the saw, further reducing vibration for more precise cutting.